Richard Cole, who was then-Colonel Jimmy Doolittle’s co-pilot during the April 18, 1942 air raid on Tokyo, less than five months after the United States’ entrance into World War II, will be the main attraction at the Planes of Fame Air Show at Chino Airport on May 5 & 6. Cole, 102, is the last surviving member of the Doolittle Raiders, 80 airman with the United States Army Air Corps, consisting of 16 five-man crews who used 16 B-25 medium range bombers that flew from the deck of the aircraft carrier U.S.S. Hornet to carry out what was planned as a nighttime raid but was actually made during daylight hours on Tokyo, the first air operation to strike the Japanese Home Islands during the war. Though the raid caused relatively minor material damage to the targets, it demonstrated that Japan itself was vulnerable to American air attack and signaled American resolve in the aftermath of the Japanese Naval Air Corps attack on Pearl Harbor. It pushed Japan’s primary naval strategist, Admiral Isoroku Yamamoto, to undertake an effort to blunt U.S. naval power in the Central Pacific with an attack on Midway Island less than two months later, resulting in what was for the Imperial Japanese Navy the catastrophic loss of four aircraft carriers and the reversal of Japan’s until-then favorable military momentum. Colonel Doolittle’s crew aboard the Hornet, from left to right: (front row) Lt. Col. James Doolittle, pilot; Lt. Richard E. Cole, copilot; (back row) Lt. Henry A. Potter, navigator; SSgt. Fred A. Braemer, bombardier; SSgt. Paul J. Leonard, flight engineer/gunner. Planning for the raid had called for the planes to launch from the aircraft carrier U.S.S. Hornet’s deck at around 6:30 p.m. when they were roughly 550 miles distant from Japan. 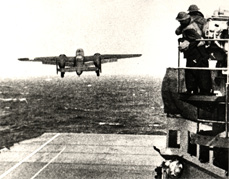 After arriving over Tokyo around 11 p.m., ten of the trailing planes were to be guided to positions over their targets by orienting from the fire to be created by the incendiary bombs dropped from the lead plane, piloted by Doolittle and co-piloted by Cole, while two planes were to bomb designated targets in Yokohama, two were to hit specified targets in Nagoya and one was to bomb Kobe. As it turned out, the approaching carrier task force, consisting of two aircraft carriers, four cruisers and eight destroyers, was spotted by a Japanese patrol boat at 7:38 in the morning and a decision was made to launch the planes at once, some 10 hours early and 200 miles farther from Japan than was intended. All 16 of the aircraft launched safely from the deck between 8:20 a.m. and 9:19 a.m. and arrived over their targets between noon and 1:15 p.m. Colonel Doolittle’s B-25 lifting off from the Hornet the morning of April 18, 1942. Richard Cole was the co-pilot. The original plan called for the planes to continue westward and to land in Chuchow, Lishui, Yushan, and Chienou in China, as returning to the carrier task force was not viable. The twin engine B-25’s were so large they had to be crane loaded onto the Hornet before leaving San Francisco, and landing planes that large on a carrier deck would have been impossible. After landing at the forward bases in China, the intention was for them to fly on and assemble at Chungking and eventually make their way to India. After having launched ten hours early, by the time the planes had completed their bombing runs and were approaching China after 13 hours of flight it was night and the pilots could not visually locate their planned landing fields. Two were so low on fuel that they ditched on the coast of China. Thirteen other planes made it over the Chinese mainland but the crews were forced to either crash-land or bail out from the planes, which pilotless and crewless flew on and crashed. A single plane whose pilot made a last minute decision to turn northeastward after the bombing mission managed to land intact, at Vladivostok in Russia. Two members of one of the crews that ditched off the Chinese coast drowned before reaching shore. The other three were captured by the Japanese, as was the entirety of another crew that parachuted down in China. Three of the eight captured were executed by the Japanese. A fourth would die in captivity before the war ended. Fourteen complete crews, minus a single crewman who was killed while parachuting, eventually made their way out of China or Russia and returned to duty or the United States. 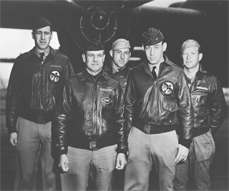 All of Doolittle’s crew, including Cole, reunited shortly after they had bailed out and were back in action with the Army Air Corps by June 1942. 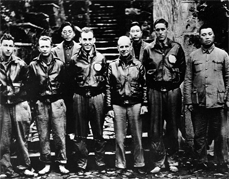 Col. Doolittle (frontmost) and his co-pilot Richard Cole with members of their flight crew and Chinese officials in China after the April 18, 1942 Tokyo raid. Richard Cole is to Doolittle’s right. Cole was born on September 7, 1915 in Dayton, Ohio. He graduated from Steele High School in Dayton, and completed two years college at Ohio University. He enlisted in the Army Air Corps on November 22, 1940, completing pilot training in July 1941, at which time he was commissioned as a second lieutenant. He remained in the China-Burma-India Theater after the Tokyo Raid until June 1943, and served again in the China-Burma-India Theater from October 1943 until June 1944. He remained in the Army Air Corps throughout the war and thereafter, until he was relieved from active duty in January 1947. Seven months later, however, he returned to active duty, in August 1947. He was an operations advisor to the Venezuelan Air Force from 1959 to 1962. During peacetime, he was stationed in Ohio, North Carolina, and California. He was rated as command pilot and achieved the rank of colonel. His decorations include the Distinguished Flying Cross with 2 Oak Leaf Clusters, Air Medal with 1 Oak Leaf Cluster, Bronze Star Medal, Air Force Commendation Medal, and Chinese Army, Navy, Air Corps Medal, Class A, 1st Grade. The Planes of Fame Museum air show was in danger of not coming off this year, after a civil lawsuit was filed last year in San Bernardino County Superior Court by four Chino Airport tenants, who claimed their businesses were negatively affected by the event. Yanks Air Museum, Flying Tigers Aviation, SOCAL MRO and Zangeneh Aeronautics, in a lawsuit filed March 27, 2017, maintained that the air show “physically blocks and obstructs various airport businesses from operating by erecting fences and other barriers that keep would-be customers from accessing their businesses.” The four entities collectively sought to be recompensed for lost business dating back to 2013. Some order of a settlement was reach last month, and the action was dismissed. Flying Tigers President Michael Thayer and Yanks Air Museum Founder Charles Nichols said they are now prepared to participate in the event. Nichols said that Yanks Air Museum, which features the world’s largest collection of historic all-American aircraft, will display and fly the museum’s aircraft at the event. Chino Airport is located at 7000 Merrill Avenue in Chino. The air show will feature more than 50 historic aircraft, between the hours of 8 a.m. and 4 p.m. on both days. General admission is $25. Children 11 years and younger are free. General parking is free. Preferred parking is $17.50 and can be purchased on the museum’s website.